Since today is Christmas Eve, we decided to bring you guys a recipe which many Portuguese love to enjoy on this wonderful holiday. This dish is Bacalhãu de Consoada, which is codfish typically made on Christmas Eve. Of course there is a different way to make codfish for every occasion, its the Portuguese way! 1) Rinse the cod under cold running water. Place the fish pieces in a large pot, cover with water and refrigerate for 24 hours, changing the water 3-4 times. 2) Once done, pour out the water, and refill with enough boiling water to cover the fish by several inches. 3) Add the collard greens and potatoes to this pot as well. Cover the pan with a dishtowel and leave the cod to cook in the hot water on medium to high heat until the fish is well cooked and the potatoes are done. 4) Once done, drain the liquid, and remove any bits of skin or bone from the cod. 5) For making the sauce, saute the olive oil and garlic in a saucepan on medium heat. Once the garlic has slightly browned, remove from the heat, add the vinegar, mix well and serve in a small bowl. 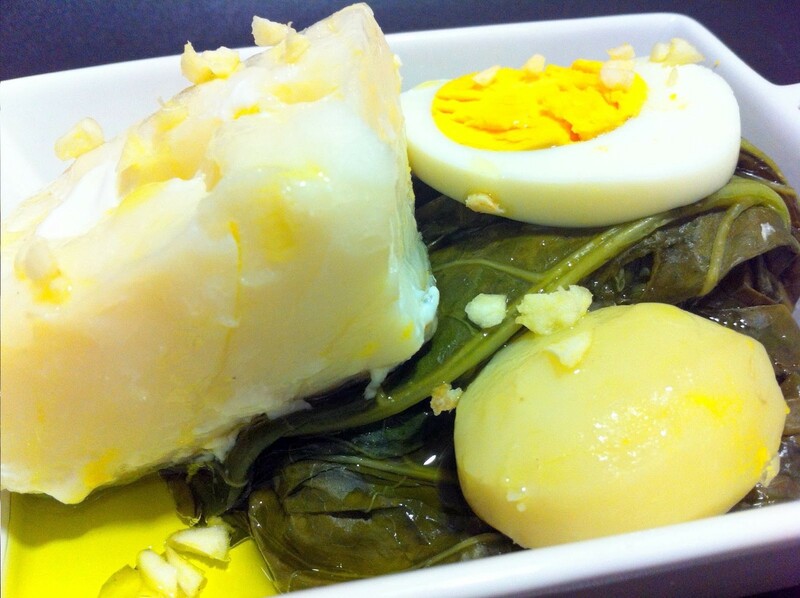 6) Now place the sliced eggs alongside the bacalhau, collard greens, and potatoes on a platter alongside the sauce and serve.